Note: This week’s share from The Good Food Collective included so many fresh veggies that it was difficult to decide which to use on a pizza. So, I asked my Facebook followers for ideas. After seeing the picture of the choices a couple of friends suggested using the only fruit in the mix, watermelon! After hesitating a bit, I accepted the challenge. I added some fresh chopped basil to my usual dough recipe. Because I didn’t want the crust to be soggy, I only used a small amount of grilled watermelon to top the pizza. 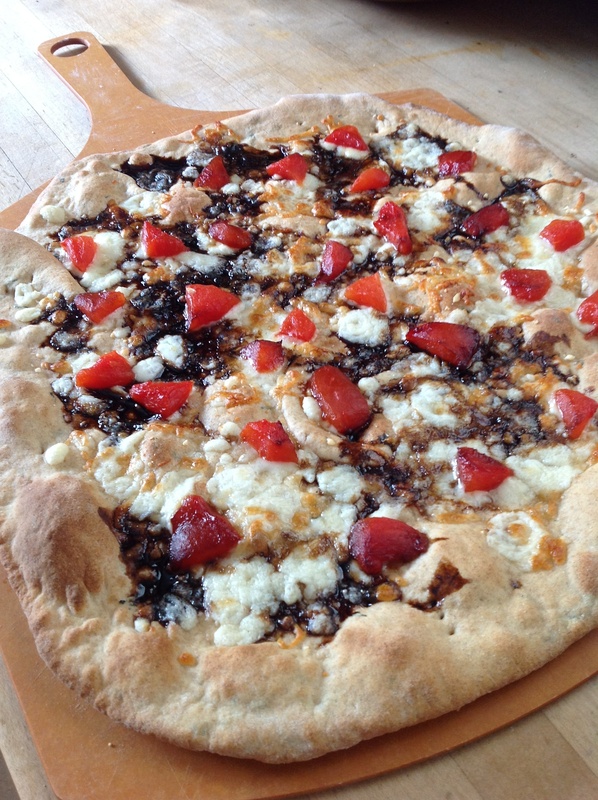 The balsamic reduction sauce was a first for my pizzas, but won’t be a last. All the flavors tasted great together. The basil in the crust was mild but noticeable. The balsamic sauce tasted wonderful with the cheeses. The watermelon held some of its sweet flavor and was delicious with the other ingredients. What I thought was a crazy idea turned out to be a fantastic pizza!